Sorry I’ve been a bit absent…life got a bit complicated the past week and I wasn’t home to do any stamping and just had my posts that I had worked ahead on. But I’m back now and trying to back into the swing of everything and starting out with this card for the SUO challenge…a single layer card. Now a single layer card is definitely a CAS card so this was an easy one for me. I knew I wanted to do a ‘silhouette’ look…so I just had to figure out how to go about it. My Happy Watercolor Set was just perfect for what I wanted to do! Whisper White 4 1/4 x 11 folded. 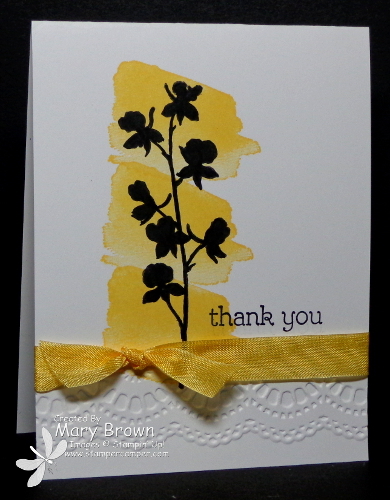 Stamp the Flower image using StazOn Jet Black and color in with a Basic Black Marker. Tie a piece of Daffodil Delight Seam Binding around it and yep…you are done! It IS that easy! Make sure you check out what the rest of the SUO design team did with the challenge! This entry was posted in Clean and Simple (CAS), SUO Challenge and tagged Happy Watercolor. Bookmark the permalink. ok, that is the last straw for me…I had been able to withstand the temptation to add that beautiful set to my next order but now I am afraid I will not be abl to resist. This is a knock-out card, Mary! Thanks so much for sharing and the C&S really made the focus stay on the card.